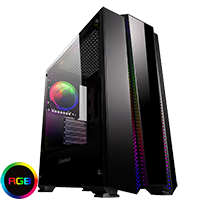 Brand new for 2018 Game Max are proud to introduce the well-built Phantom RGB Mid-Tower Tempered Glass Gaming Case, with a full tempered glass left side panel. Fit up to six fans with one Dual-Ring Halo Spectrum fan pre-installed at the back, the front of the Phantom has been inlaid with a colourful RGB LED strip offering a smart and professional design and ultimately satisfying any gamer�s aesthetic needs. You can sync your rainbow fans with the front LED strip and get up to 15 different colour modes giving you unlimited options using the PCB hub that is included and you are able to connect to 6 x 6pin fans and 2 LED strips, easily control your LED�s through the LED button located on the top so you are always in control. As well as an LED button the Phantom comes with 2 x USB3.0 and they are all conveniently located on the top on the right-hand side for easy user access and experience superior speed. In line with the Game Max ethos this case offers style, performance and the ultimate experience. Design - The Phantom - professional and smartly designed PC gaming case, the exterior includes a tempered glass left side panel and the front made from acrylic which is complemented well with the LED strip built in, the Phantom is a case that matches the visual aesthetic needs of any gamer. Tempered Glass Side Panel - The Phantom comes with a full tempered glass left side panel to show off your internal components and your Spectrum LED lighting along with all its glory. LED Button - The LED Button, conveniently located on the top, can make your Spectrum fans colour sync with the front RGB LED strip, satisfying any gaming enthusiast and offering you unlimited control. PCB Hub - To enable syncing to your spectrum fans with your LED strip at the front of the Phantom we have included a PCB Hub that is powered by a 4pin Molex connector and can connect up to 6 x 6pin fans and connect your LED strip in the two remaining slots. Cooling Fan Support - The Phantom can support up to 6 fans, with 1 x 120mm Dual-Ring Halo Spectrum fan at the back to reduce any overheating of your internal components. Water-Cooling Support - As well as being able to fit up to six fans you can enhance your cooling further with room for up to a 240mm radiator at the top, room for up to a 280mm radiator at the front and room for up to a 140mm radiator at the back offering extensive cooling support. Removable Dust Filter - A dust filter on the top and bottom of the Phantom helps to prevent dust from getting into your build and helps improve the performance of your chassis. Vertical and Horizontal GPU - The Phantom offers you the chance when building your PC gaming case to place the graphics card vertical or horizontal allowing you to be flexible and adjust your build to suit your needs. I/O Ports - The Phantom comes with super speed 2 USB3.0 ports and HD audio which are conveniently located on the top right-hand side for easy user access. Drive Bay Notes: Please note if you choose to have your graphics card vertical you can only use 1 x 2.5" SSD.